Long, long ago, almost 3 years at this point, Fallout 4 was released. Thought it gets a bit of a bad rap in terms of some of its failing, and some of them are rather rough, it was still a very fun and enjoyable game. Killing super mutants and raiders in the Wasteland is something I just can’t get enough of. But there was something I wasn’t prepared for enjoying: Settlement Building. A while back, A friend of mine was pushing me to join Monster Hunter World. It took me more than a little bit of reluctance to get there, but I eventually did. Now, I’m enjoying it well enough, and wanted to talk a little about my limited experiences with it. It took me just about 10 hours, ages of patience, and a number of days I just cannot seem to remember to beat the final boss of Dark Souls 3, but I did it. I’ve mentioned I’m not very good a video games, right? Well. Here is how a very bad video game player took him down. If It Bleeds, We Can Kill It – Dark Souls 3. Beware. 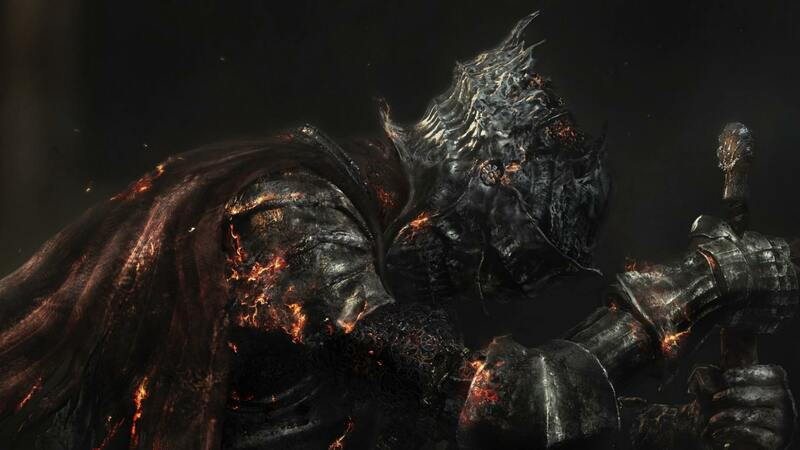 This post will have spoilers for Dark Souls 3. I know its been a while, but I’ll still put the disclaimer here. I’ve been having a revitalization in playing Dark Souls, and I’ve put a bunch of time into it lately. Come, stay a while and listen! I have been warped. Things about me have changed. There are certain pursuits that I no longer enjoy because of other things I have been exposed to. Dark souls is the culprit of one of these things. I am, at long last, playing the capstone of the trilogy, and it is reminding me of things I once thought were fun, but no longer are. This post is a long, long time coming, but I do want to still keep up with the games I play to some degree. I picked up FFXV after some posts and recommendations by a few friends. How did I like it? lets take a look. I’ve taken a short break (about 3-5 weeks) from my D&D articles, and I’m going to write a few thoughts about the games I’ve played so far this year. I don’t think its going to be anything groundbreaking or amazing, but it’ll be fun. Follow me now into the first of the series: Thea: The Awakening. This game, something that will have been our for 2 years this November, is easily among the favorites I’ve ever played. It took me a little bit of time to figure out why, but man, I am hooked. I mentioned before that I had started Assassins Creed: Black Flag a short while ago, and its been a strange start. Its a cool puzzle game, with a neat theme and a fun ship to ship combat system. I keep coming back to the game, mostly because its convenient, but also because its an enjoyable distraction.